Tektite manufactures technologically advanced lighting products designed for extreme environments. Our rugged LED flashlights, LED replacement bulbs, dive lights, strobes, marker lights, tactical lights, infrared strobes, Tekna knives and accessories are relied upon by scuba divers, mountaineers, police officers, fire fighters, military and other demanding customers. 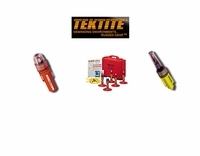 Tektite brand lights are made in the U.S.A. and feature HIGH-TEK™ lamps, Engineering-grade polymers, computer-designed reflectors and other features that makes Tektite the best choice when quality, reliability and performance is required.